Adroit® dual arms holding a box. 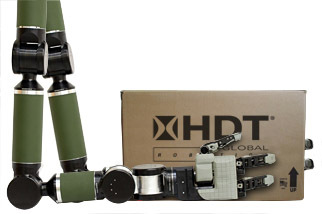 With a lift capacity of over 150 pounds and a fully compliant grasp, an HDT Adroit dual arm manipulator can lift most of the items found in a warehouse. HDT provides a great opportunity to reduce costs in material handling through productivity gains. Click here to access an HDT white paper describing some of these opportunities. Note: While HDT’s Adroit end-effectors have the dexterity and force control to handle each-pick operations, the speed of picking individual goods is generally limited by vision-processing requirements.